Osteoarthritis affects the knee joint more than any other joint. The knee joint contains four bones—femur, tibia, patella, and fibula—and three compartments. Osteoarthritis can affect one, two, or all three of those compartments. When all three are affected, it is called tricompartmental osteoarthritis. A physical examination may provide the first indication of which compartment is affected. Your doctor will ask you to stand and to walk. While standing, your doctor will look for any postural irregularity, such as a valgus (knock-kneed) or varus (bow-legged) deformity. There may also be obvious or subtle differences in leg length. When you are asked to walk, your doctor will observe gait abnormalities, such as limping, shuffling, or being unable to walk. Your doctor also will check for signs of joint laxity and check your range of motion. Your doctor will also observe the knee for joint effusion, palpate the knee when in a flexed position, as well as check for signs of muscle atrophy and skin changes. X-rays may be needed to confirm cartilage loss and joint damage associated with the abnormalities observed during your physical examination. On X-ray imaging, cartilage loss will be visualized as a narrowing of the joint space. Often, the narrowing will develop unilaterally (on one side). Medial (inner knee) narrowing is observed in 75 percent of cases, resulting in a bow-legged gait and appearance. Lateral (outer knee) narrowing is far less common and is associated with a knock-kneed appearance. Close to half of all knee osteoarthritis patients have evidence of inner knee cartilage damage (patellofemoral damage) on X-rays. Medications: This is traditional treatment, aimed at controlling pain and managing other osteoarthritis symptoms. Drugs to slow disease progression are still lacking. Exercise: Low-impact exercise helps to preserve strength and range of motion of affected joints. Weight management: Carrying extra pounds adds force to your joints as you move. That is exactly the burden you want to avoid with knee osteoarthritis. Topical pain relievers: Topical creams, gels, and ointments provide alternative pain relief for people who have had an inadequate response or cannot tolerate oral medications. Lateral wedge insoles: Special insoles are designed to help reduce pain associated with medial knee osteoarthritis by changing mechanics of the knee. Viscosupplementation: A series of knee injections with a gel-like substance (hyaluronates) is used to supplement the properties of synovial fluid in knees affected by osteoarthritis. Intra-articular steroid injections: An injection into the affected knee joint with a corticosteroid medication is performed to reduce inflammation and pain. Dietary supplements: Several supplements are marketed for joint health. While they are generally considered safe, their effectiveness has not been proven. Transcutaneous electrical nerve stimulation (TENS): This is a small device that directs mild electric pulses to the nerves in or around a painful area. Acupuncture: Various techniques which are used to stimulate specific anatomical points on the body. Pain relief is the goal for people with arthritis. When conservative treatments yield inadequate results, the next step may be surgery. Arthroscopic debridement or osteotomy may be considered appropriate in certain cases, prior to considering total knee replacement. When only one knee compartment is involved, your doctor and an orthopedic surgeon may recommend a partial knee replacement, also known as a unicompartmental knee replacement. Besides a unicompartmental or total knee replacement, there is also a bicompartmental knee replacement. The bicompartmental knee replacement is an option for people with knee osteoarthritis of the medial and patellofemoral compartments. The main advantage of a partial knee replacement is that normal bone and the two anterior cruciate ligaments are preserved. Hospitalization time, recovery time, and the risk of complications are also reduced. How long will it be before the other compartments wear out? Am I at an age where I will likely be faced with revision surgery in the future? Might I be able to maintain normal mobility with a partial knee replacement? In the end, your doctor will assess the severity of your condition and recommend the best course of action for your individual case. Most people with knee osteoarthritis have unequal involvement of the three knee compartments. Treatment options, especially surgical options, depend on whether you have unicompartmental, bicompartmental, or tricompartmental knee osteoarthritis. Knee pain is a common medical complaint which takes people to their primary doctor for an initial evaluation. 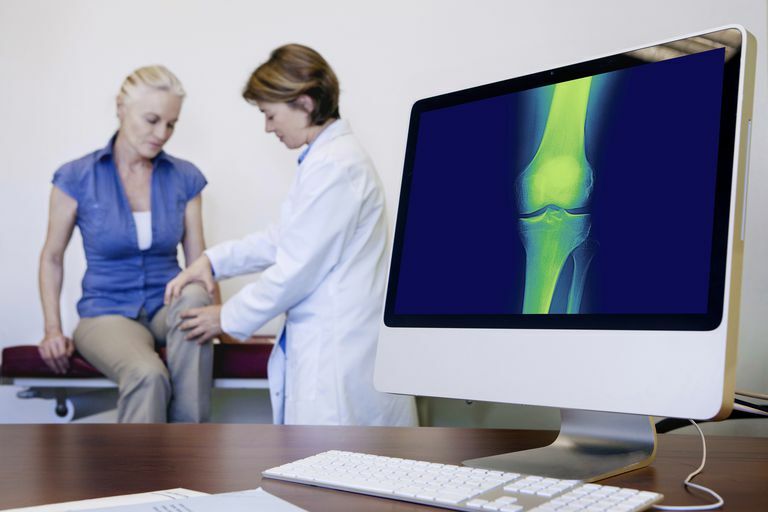 An accurate diagnosis is essential to managing knee osteoarthritis. Appropriate treatment follows the diagnosis. An orthopedic specialist may ultimately be needed to optimize the treatment plan. There are numerous conservative treatments to try. When it is time to consider surgery, find the best orthopedic surgeon available to you. Beutler, Anthony, MD et al. Physical Examination of the Knee. UpToDate. Updated April 13, 2017. Hochberg, G.; Altman, R.; April, K. et al. American College of Rheumatology 2012 Recommendations for the Use of Nonpharmacologic and Pharmacologic Therapies in Osteoarthritis of the Hand, Hip, and Knee. Arthritis Care & Research. 2012;64(4):465-74. DOI: 10.1002/acr.21596. Lane, Nancy E. and Wallace, Daniel J. All About Osteoarthritis. The Lower Body. Pages 102-105. Oxford University Press. 2002. Sabatini, Luigi et al. Bicompartmental Knee Arthroplasty.Annals of Translational Medicine. 2016 Jan; 4(1): 5. Is Total or. Partial Knee Replacement Right for You?